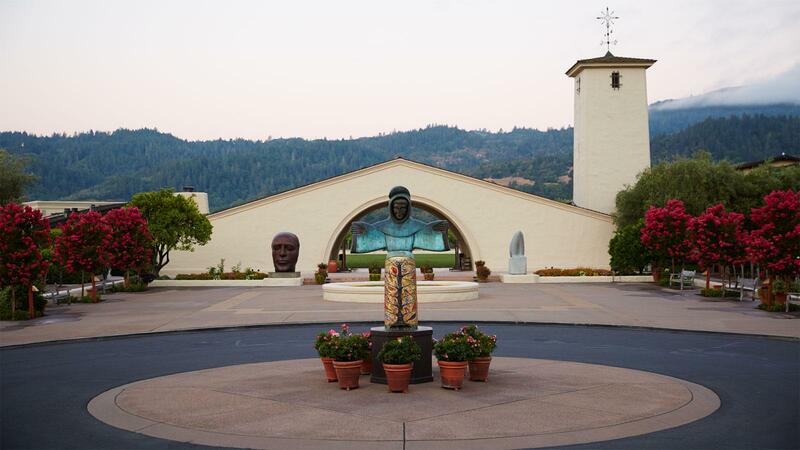 Founded in 1966, Robert Mondavi Winery stands tall in Napa Valley. Senior editor James Molesworth will become Wine Spectator's lead taster for California Cabernet Sauvignon at the end of this year. He recently made a trip to Napa Valley and is posting dispatches from some of the region's top wineries. And don't miss our Q&A with James on his Napa Cab eureka moments, his scoring philosophy, and what he's up to when he's not tasting wine. Napa Valley as we know it started with Robert Mondavi. On my first official tour through California's marquee area code for Cabernet Sauvignon, I'd be foolish to start anywhere else. As for background, there is no better synopsis of the man's life and achievements than that written by my colleague, senior editor James Laube. Today, Robert Mondavi Winery is experiencing both change and continuity under the ownership of Constellation Brands. Longtime winemaker Geneviève Janssens, 68, who has worked with the Mondavi operation since the late 1970s, will step back from day-to-day operations and assume the role of chief winemaker. Nova Cadamatre, 35, who worked for the Mondavi operation previously and had recently moved to the Finger Lakes to start her own Trestle 31 label, will now return and handle the day-to-day, aided by the recently promoted Kurtis Ogasawara, 30. But even though she is stepping back, Janssens is still very much involved. And she is still very loyal to the Mondavi name. "Even though I have a French accent, I was hired by the Mondavis, not the Rothschilds," she says, referring to the joint venture the two families created known as Opus One, where she made the wine from 1989 through 1997. "I saw the modernity at Opus when that was created. But at Mondavi the idea is to maintain classicism," she says proudly, always referring to the late Robert Mondavi as "Mr. Mondavi." Geneviève Janssens will continue to ensure the classic styling of Robert Mondavi wines. The classicism is on display in the lineup of 2015 Cabernets, from a warm and dry vintage. "We want freshness and balance," stresses Janssens. "If the wine is in a riper style, it is a function of the vintage and not a conscious decision of the winemaker." We tasted through a range of 2015 Cabernets, and the rubric of freshness and balance is evident. Yet the wines are very much Cabernet, and very much Napa as well, and I like the combination of all those factors. Power with grace, depth without being bombastic. WineSpectator.com members: Read James Molesworth's tasting notes on a range of top 2015 Mondavi Cabernets, including the To-Kalon Vineyard Reserve.